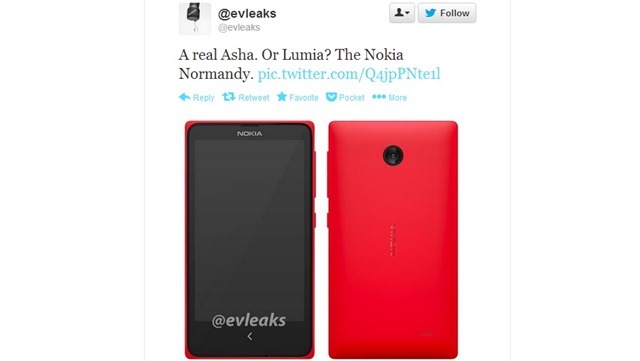 Nokia Normandy Is The Finnish Company’s Low-Cost Android Prototype? Rumors have it that Nokia has been experimenting with an Android-based smartphone for quite a while now. However, they were probably not able to push for it entirely because of a possible exclusivity deal with Microsoft’s Windows Phone. A few years later however, with the impending purchase of Nokia’s assets by the software company have probably ruffled some feathers and revealed the Nokia Normandy. (image c/o: @evleaks) And according to a follow up report by The Verge, this might be the Android phone the brand has been experimenting with. While there’s no evidence to say if the project is cancelled, the transfer of Nokia to Microsoft might prevent this phone to ever be in the hands of consumers. According to the report, the phone was designed to be a low-cost Asha device that runs specific Android apps. However it will have a walled garden like Amazon’s Kindle line with its own app store. From the image, it does look like a low-cost Lumia, so we might have expected a 5MP shooter in there with modest specs – probably right up the Asha alley too. Supposedly the phone is planned to launch this 2014, but with the Microsoft acquisition looming around the corner, we might not be surprised if this ends up ultimately cancelled. Android does compete with the Windows Phone ecosystem, after all.